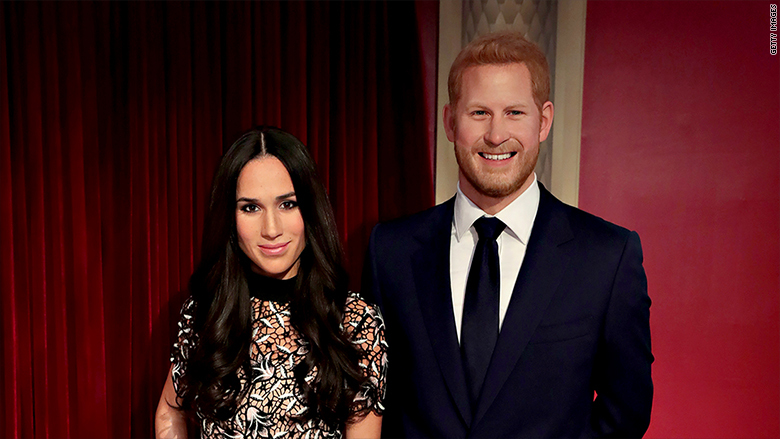 Madame Tussauds has unveiled its new Meghan Markle wax statues in London and New York. 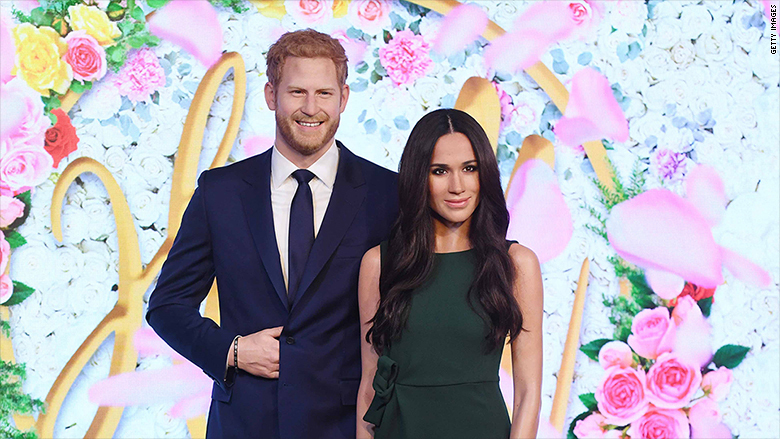 The chain of tourist attractions, which feature wax figures of celebrities and cultural icons, made the big reveal ahead of the American actress' wedding to Prince Harry on May 19. The statue that will be on display in London depicts Markle in a green dress alongside her fiancé. In the New York version, she is shown wearing a black and white dress. Prince Harry's statue in London, which was originally created to mark his 30th birthday in 2014, has been updated with a new beard. Each of the Markle statues cost roughly £150,000 ($204,000) to create. Madame Tussauds' London museum already features wax statues of Queen Elizabeth II, Prince William and his wife, Catherine, the Duchess of Cambridge. 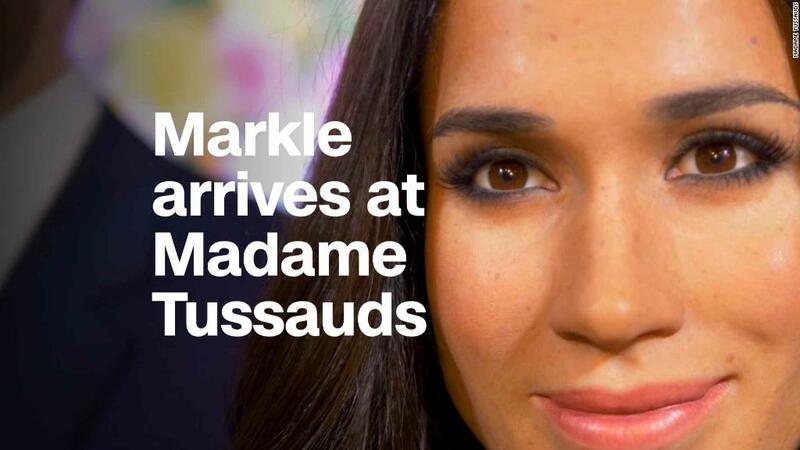 A Madame Tussauds spokesperson told CNNMoney in March that Markle did not pose for the statues and the company had to rely on "research information and photography" to capture "Meghan's infectious and warm personality." Markle shot to fame in her role on the television show "Suits." Her engagement to Prince Harry was announced in November. Madame Tussauds has unveiled its new Meghan Markle statue in London alongside an updated Prince Harry. Tourist attractions, travel companies and hotels are keen to cash in on royal wedding fever in the United Kingdom. However, travel experts are not expecting an immediate boost for British tourism. Analysts expect that any spike in visits from royal fanatics will be counteracted by the desire of other tourists to stay far away from the hubbub. Instead, the nuptials are expected to act as a marketing tool to entice tourists in the years to come. The 2011 wedding of Prince William and Kate Middleton did not result in a noticeable uptick in tourist arrivals or spending, according to the UK Office for National Statistics. Related: How does the royal family make its money? Tussauds' owner Merlin Entertainment (MERLY) could use a boost. It had a difficult summer season last year as terror attacks in London and bad weather kept visitors away.